Quanta Morph Your Life! As multidimensional living joy is introduced deeply into resonance, there is a clarification and stability of our local vibration in the continuum. This opens the mind, emotion and our whole being including your physical body to higher dimensions and deeper awareness. What would life be like if you were freer of negative energies? Happy life greater wellbeing perhaps would manifest as anything less than what you desire falls away in deep harmony. Joy then starts to bloom deeper and pure true peace manifests and starts to appear in your local reality. As internal motivation increases procrastination frequencies no longer have anything to latch or attach to allow an idea to flow into reality much easier. Energy plus the idea is the nature of reality so what will occur when the idea and energy power are more stable and clear? This is the purification of the flow of the idea into reality getting the idea out of the mind in higher dimensions focused into allowing this idea to flow out into local 3D reality. What would your local reality be like being surrounded by your ideas? Creation is a mirror where we experience our manifestations. With our manifestations being a true reflection of us and our gift, joy then organically presents and grows allowing even more wonderful ideas and manifestations. A happy life. This is where our Happy Life and Happy Home Quanta card comes in. As a bonus an energetic clearing of inherent toxicity and emf wireless RF radiation smog is offered with this technology. There are many electronic warfare sources out on the planet today. Imagine your energy field surrounding your body resonating this protection 24/7 all day every day with this card specifically assigned to you. Take the next step into higher realms now in this lifetime. 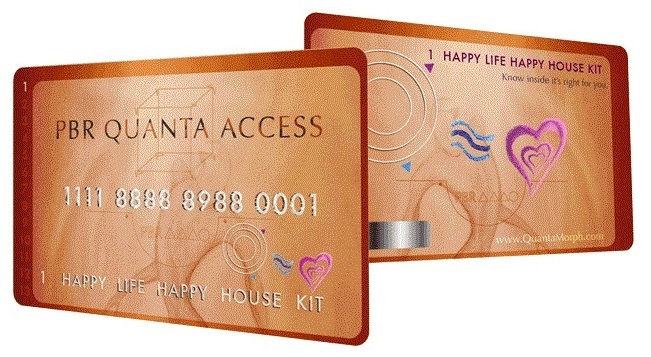 To order this card that is the size of a credit card, pop to our web site http://quantamorph.com/index.php/product/1-happy-life-happy-house-card/. Orders are mailed out within 5 days of receiving the order. Many blessings of deep pure true peace.